Balderton’s Great War Diary tells the story of how the village and James Simpson Limited’s workforce at Lowfield faced the hostilities, the horrors and the heroism 1914-18. 64 pages. The Booklet is on sale (£3) at WH Smith’s in Newark Market Place. 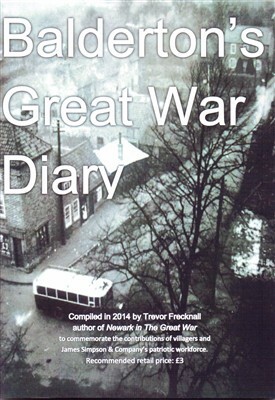 Signed copies (£3.50 inc. p&p) are available from the author, Trevor Frecknall, at 9 Main Street, North Muskham, Newark, Notts NG23 6EZ; cheques made payable to T and GM Frecknall. This page was added by Website Administrator on 25/07/2014.